Better to go slow enough to do the job well. If you have enough seed to plant 15 acres you might be better to put that seed on 5. Why? Because planting too thin is a common cause of poor results. That five great acres can yield the seed to plant the next five and the next 50. Large prairie plantings thinly populated by native plants leads to weeds, work, and aggravation. An example of well done: Volunteers Tom and Jenny Mitchell had 28 acres of former row crop ground to plant but did the job in four plantings of 7 acres each. Below they stand in their very nice two year old prairie planting with 52 species planted at about 25 pounds per acre bulk weight. 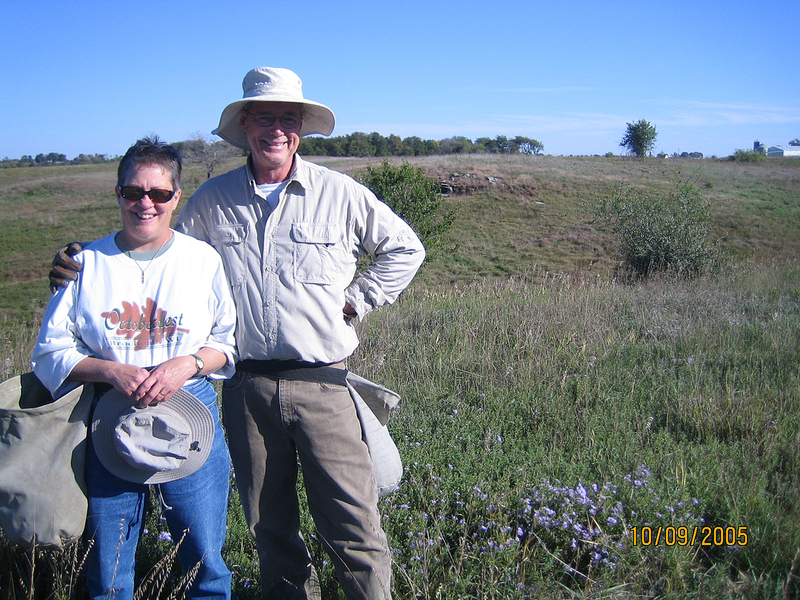 They restricted the species in the planting to those that occurred on the adjacent remnant prairie. After two years they had 56 native plants, a native mean Conservatism of 4.4, and transect Floristic Quality Index of 26. If you don’t know what those values mean, the point is they got a lot of nice plants filling in what was a crop field. The planting looks like a remnant prairie. Now, after a decade has passed this planting is still looking very good. Not sure. Will forward to them. I often hear problems associated with new reconstructed prairies getting dominated by Big bluestem and Indian grass and many forb species get pushed out because of their (grasses) early dominance. Any solutions that would help on the starting end? Sorry for the tardy response. Fire season, etc.. Yes, the graminoids come on after several years. We put little to no big bluestem or indian grass in our plantings. We put lots of northern dropseed, the Panicums (not virgatum), side oats, june grass. We want the plantings to have a bunch of grass as the remnants we are looking have a lot of grass too. We have plantings that are ten and fifteen years old that you would like. They have lots of forbs, a little of big blue and indian, and lots of other grasses.